How You Can Treat Severs Disease? Posted in: Severs Disease. Tagged: Calcaneal Apophysitis, Severs Disease. Sever’s disease is a condition characterized by pain in one or both heels with walking. The pain is caused by shortening of the heel-cord. It usually affects children between the ages of 10 and 13 years old. During this phase of life, growth of the bone is taking place at a faster rate than the tendons. Sever’s disease is also called calcaneal apophysitis. Sever’s disease is a common cause of heel pain in physically active growing kids. It usually occurs during the growth spurt of adolescence, the approximately 2-year period in early puberty when kids grow most rapidly. This growth spurt can begin anytime between the ages of 8 to 13 for girls and 10 to 15 for boys. Peak incidences are girls, 8 to 10 years old. boys, 10 to 12 years old. The condition can be quite disabling and tends to affect those who are very busy with sporting activities. In the initial stages of the condition, most children displaying signs of Severs disease will tend to hobble or limp off the sports field or court and complain of sore heels near the end of activity. As the condition progresses, children may complain of pain during activity and in severe cases prior to sporting activities. Kids heel pain can be quite discouraging for active children but, early treatment can resolve this type of foot pain in children very quickly. Posted in: Adult Aquired Flat Foot. Tagged: Adult Aquired Flat Foot. Dysfunction of the tibialis posterior tendon is a common condition and a common cause of acquired flatfoot deformity in adults. Women older than 40 are most at risk. Patients present with pain and swelling of the medial hindfoot. Patients may also report a change in the shape of the foot or flattening of the foot. The foot develops a valgus heel (the heel rotates laterally when observed from behind), a flattened longitudinal arch, and an abducted forefoot. Conservative treatment includes non-steroidal anti-inflammatory drugs, rest, and immobilisation for acute inflammation; and orthoses to control the more chronic symptoms. Surgical treatment in the early stages is hindfoot osteotomy combined with tendon transfer. Arthrodesis of the hindfoot, and occasionally the ankle, is required in the surgical treatment of the later stages of tibialis posterior dysfunction. Diagnostic testing is often used to diagnose the condition and help determine the stage of the disease. The most common test done in the office setting are weightbearing X-rays of the foot and ankle. These assess joint alignment and osteoarthritis. 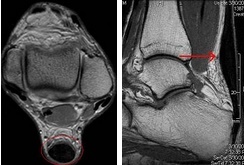 If tendon tearing or rupture is suspected, the gold standard test would be MRI. The MRI is used to check the tendon, surrounding ligament structures and the midfoot and hindfoot joints. An MRI is essential if surgery is being considered. When conservative care fails to control symptoms and/or deformity, then surgery may be needed. The goal of surgical treatment is to obtain good alignment while keeping the foot and ankle as flexible as possible. The most common procedures used with this condition include arthrodesis (fusion), osteotomy (cutting out a wedge-shaped piece of bone), and lateral column lengthening. Lateral column lengthening involves the use of a bone graft at the calcaneocuboid joint. This procedure helps restore the medial longitudinal arch (arch along the inside of the foot). A torn tendon or spring ligament will be repaired or reconstructed. Other surgical options include tendon shortening or lengthening. Or the surgeon may move one or more tendons. This procedure is called a tendon transfer. Tendon transfer uses another tendon to help the posterior tibial tendon function more effectively. A tendon transfer is designed to change the force and angle of pull on the bones of the arch. It’s not clear yet from research evidence which surgical procedure works best for this condition. A combination of surgical treatments may be needed. It may depend on your age, type and severity of deformity and symptoms, and your desired level of daily activity. Posted in: Heel Pain. Tagged: Heel Pain. See your doctor immediately if you have Severe pain and swelling near your heel. Inability to bend your foot downward, rise on your toes or walk normally. Heel pain with fever, numbness or tingling in your heel. Severe heel pain immediately after an injury. Schedule an office visit if you have. Heel pain that continues when you’re not walking or standing. Heel pain that lasts more than a few weeks, even after you’ve tried rest, ice and other home treatments. Which are the Key Treatments And Causes Of Achilles Tendinitis Ache ? Posted in: Achilles Tendon. Tagged: Achilles Tendon. There is insufficient evidence from randomised controlled trials to determine which method of treatment is the most appropriate for the treatment of acute or chronic Achilles tendonitis. The patient should abstain from aggravating activities, but with a minimum of rest in order to preserve overall fitness. Possible treatments are non-steroidal anti-inflammatory drugs (NSAIDs), ice, rest, increased warm-up/stretching exercises, physiotherapy and heel lifts (orthotic devices – used on both sides to prevent a gait imbalance). Other treatments evaluated in a Cochrane review were heparin, steroid injections, glycosaminoglycan sulfate, Actovegin?, and topical laser treatment. There was no clear evidence of benefit from these. Casting is an option for resistant Achilles tendonitis. Drugs – analgesics and NSAIDs. Surgery is sometimes used for resistant Achilles tendonitis, but usually as a last resort. Other recently reported treatments include continuing sporting activity in conjunction with rehabilitation, low-energy shock wave therapy and topical glyceryl trinitrate . Posted in: Plantar Fasciitis. Tagged: Heel Pain, Plantar Fascia, Plantar Fasciitis. You are at a greater risk for developing plantar fasciitis if you are overweight or obese. This is due to the increased pressure on your plantar fascia ligaments, especially if you have sudden weight gain. Women who are pregnant often experience bouts of plantar fasciitis, particularly during late pregnancy. If you are a long distance runner, you may be more likely to develop plantar fascia problems. You are also at risk if you have a very active job that involves being on your feet often, such as a factory worker or a restaurant server. Active men and women between the ages of 40 and 70 are at the highest risk for developing plantar fasciitis. It is also slightly more common in women than men. If you have foot problems, such as very high arches or very flat feet, you may develop plantar fasciitis. 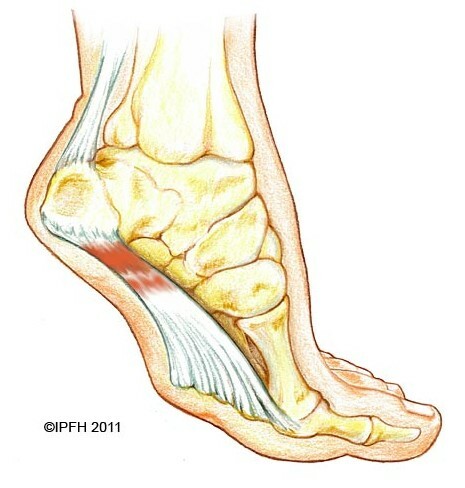 Tight Achilles tendons (the tendons attaching the calf muscles to the heels) may also result in plantar fascia pain. Simply wearing shoes with soft soles and poor arch support can also result in plantar fasciitis. Plantar fasciitis is not caused by heel spurs. 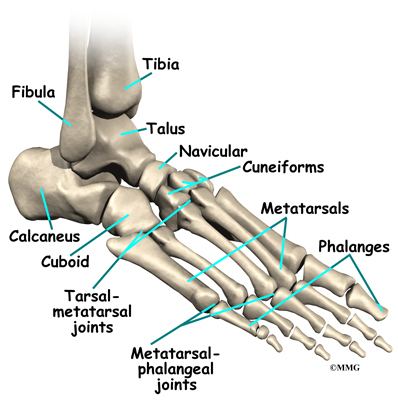 A heel spur is a hook of bone that can form on the heel bone (calcaneus) of the foot. One out of every 10 people has a heel spur, but only one out of 20 people with heel spurs experience pain, according to OrthoInfo. You’ll typically first notice early plantar fasciitis pain under your heel or in your foot arch in the morning or after resting. Your heel pain will be worse with the first steps and improves with activity as it warms up. As plantar fasciitis deteriorates, the pain will be present more often. You can determine what stage your are in using the following guidelines. No Heel Pain, Normal! Heel pain after exercise. Heel pain before and after exercise. Heel pain before, during and after exercise. Heel pain all the time. Including at rest! This symptom progression is consistent with the four stages of a typical overuse injury. Ultimately, further trauma and delayed healing will result in the formation of calcium (bone) within the plantar fascia. 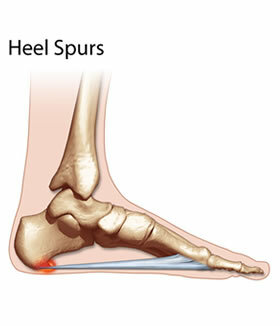 When this occurs adjacent to the heel bone it is known as heel spurs, which have a longer rehabilitation period. Night splints are treatment that can help stretch your calf and the arch of your foot. Night splints are a type of brace that holds your foot in a flexed position and lengthens the plantar fascia and Achilles tendon overnight. This can prevent morning pain and stiffness. Special orthotics, or arch supports, for your shoes may help alleviate some of the pain by distributing pressure, and can prevent further damage to the plantar fascia. A boot cast may be used to immobilize your foot and reduce strain while the plantar fascia heals. A boot cast looks like a ski boot and can be removed for bathing. Do your best to maintain healthy weight. Plantar fasciitis is caused by wear and tear on your feet. Being overweight drastically increases the pounding your feet take every day. Even losing a few pounds can help reduce heel pain. Avoid jobs that require walking or standing for long periods of time. Having your body weight on your feet all day puts a lot of pressure on your plantar fascia tissue. Replace your shoes on a regular basis. Buy new shoes when the old ones are worn-out. Make sure your shoes will fit your foot size comfortably at the end of the day. Pay attention to the width as well as the length. Use good supportive shoes that will help you with your original problem like arch support, motion control, stability, cushioning etc. Stretch regularly as part of your daily routine. There are a few special stretching techniques for the prevention. Choose soft surfaces for your exercise routine to walk, jog or run on. Rest and elevate your feet every chance you have. Strengthen your foot muscles as part of your exercise routine. Strong foot muscles provide a good support to the plantar fascia. Change your shoes during the work week. Don’t wear the same pair of shoes every day. Perform Warm up exercises such as a short period of walking, a light jog or other easy movement and then stretch before starting the main exercise. Try to avoid dramatic changes in your exercise routine. Increase your exercise level gradually. Don’t run long distance if you are used to walk. Make the change slowly and gradually. Pay attention to your foot pain, do not ignore it. Visit your doctor if the pain continues. Avoid the activities that cause you pain. Use over-the-counter Orthotics or inserts that your doctor may prescribe. Off-the-shelf or custom-fitted arch supports (orthotics) will help distribute pressure to your feet more evenly. Try to avoid barefoot walking, since it may add stress on the plantar fascia ligament.